Xyn isAn endoxylanase gene without the signal peptidesequence. The enzyme was categorized as a glycosyl hydrolase family 11 member based on the sequence analysis of the putative catalytic domain. The main product of hydrolysis by Xyn is xylooligosaccharide. We can degrade xylan into xylose in high efficiency with the synergistic action of β-xylosidase Ruxyn. We try to detect the activity of enzymes with 3,5-Dinitrosalicylic acid, but it is not so obvious. We speculate this might result from the facts that there is a big difference of the expression of foreign protein among different carriers of Pichia pastoris or different yeast strain, and that inappropriate ferment condition can result in low or even no activity of enzymes. In future research, we will try to enhance activity of enzymes by picking up suitable carriers and yeast strains and figuring out the optimal reaction conditions. We construct the gene on the carrier displaying on the surface of Pichia pastoris and express it it in Pichia pastoris with electroporation. Then we detect the expression on the surface of Pichia pastoris by observing with fluorescent microscope and by flow cytometry analysis. We fused HA-tag with N-terminal of xyn gene on ZXFα-xyn vector. 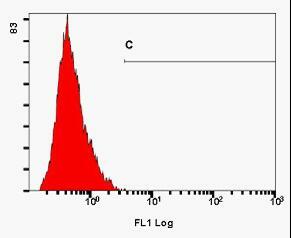 Label cells with Mouse Anti HA-Tag Polyclonal antibody and Fluorescein (FITC)–conjugated Affinipure Goat Anti-Mouse IgG(H+L). 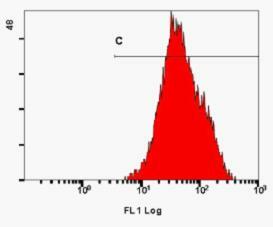 Result of flow cytometry analysis is as follows: fluorescence intensity x-mean value of Pichia pastoris with pPICZα empty vector is 0.62, with xyn-ZXFα is 67.